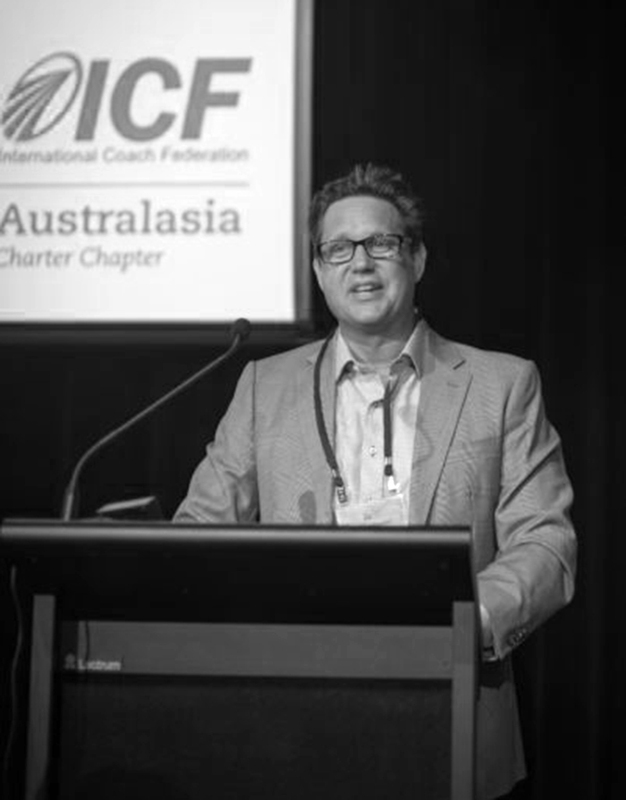 The International Coach Federation Australasia Conference wrapped up a week ago, and my sense as Master of Ceremonies was that the 250 coaches and HR professionals who converged on the Gold Coast found it to be a rich and engaging experience, with a wonderful quality and diversity of speakers, and dynamic conversations everywhere. My overall reflection is just how far coaching has come. The discussion has moved past ‘what is coaching and how do we know it works’, to a much more granular exploration of the different modes and applications of coaching. The strongest theme at the conference was the growth of team coaching. Coaches seek to have a positive impact on people, teams, organisations and broader society, and coaching groups of people is an effective way to amplify and scale this impact. It was an honour to introduce Prof David Clutterbuck, ICF Global CEO Magdalena Mook, Tammy Turner MCC, Dr Geoff Abbott at the conference, with John Raymond PCC in foreground. Professor David Clutterbuck, one of the leading proponents of team coaching around the world, spoke to the growth of this area of coaching as part of his closing keynote. Padraig O’Sullivan from The Leadership Circle (and a great addition to the ICF NSW Branch board) shared his perspective on the fundamentals of team coaching, including when to choose not to coach a group. Roma Gaster, Padraig’s partner at The Leadership Circle, gave a demonstration of how the TLC floor mat can be used as a powerful somatic tool when coaching groups of people. Dr Paul Lawrence from the Centre for Systemic Change (and the incoming ICF NSW Branch President – another fantastic addition to the ICF team) gave a ‘guided tour’ of the key evidence-based approaches to team coaching, and some of the techniques he finds to be most effective. Clearly, team coaching has momentum, and is likely to be a key driver in the market moving forward. This should in no way be seen as taking away from the role of ‘traditional’ one-to-one coaching. In fact, the two modes complement each other perfectly. An increasingly common approach – both in my practice and in the market in general – is for development engagements to have both team and individual coaching components that are mutually supportive. The team works together on overall culture, values, goals and initiatives; and then each member of the team has one-to-one coaching to focus on their individual development areas, with this work being informed by and supporting the team-level engagement. Training leaders in core coaching skills is another growing area of the market. The VUCA nature of today’s world means one of the most crucial competencies for any leader is the capacity to coach her or his team. Decision-making needs to be decentralised and nimble, and a leader-as-coach approach is a highly effective way to drive this culture. A number of the speakers discussed this topic, including some of those listed above. I had a fascinating dialogue with one of the featured panelists, Dr Geoff Abbott from the Graduate School of Business at the Queensland University of Technology, around a) just how good at coaching leaders should aim to be, and b) how can professional coaches best support leaders reach their potential in the area? For example, should leaders aim to be as proficient and multi-skilled at coaching as professional, full-time coaches? My view is ‘No…but they should still aim to be very, very good’. This is a much larger topic than I can do justice to here, and I’ll write a separate post on this soon. Bottom line: Geoff and I agreed that it is crucial for leaders to focus on developing their coaching capability, and that professional coaches have a great opportunity to assist in this process. Kerryn Vellerman from Kru Consulting and one of her colleagues shared their approach to peer coaching supervision. This is a process whereby an experienced external coach supervises groups of internal coaches on how they can lift overall coaching capability and performance within the organisation. On the topic of supervision, there was a marked divide between the audience and presenters. On a show of hands, the audience seemed split on whether supervision should be mandatory for coaches. Yet I think it was telling that every presenter who touched on the subject on stage a) undertook supervision themselves and b) was a strong supporter of supervision for coaches more generally. My view is that as a coach you have a responsibility both to your clients and to yourself to undergo regular supervision. We are fortunate in Australia to have a number of outstanding, seasoned coaching supervisors, and coaches should take advantage of this. Supervision is becoming a mandatory requirement for coaches to be considered for inclusion on many coaching panels in the UK. I hope we start to see this trend emerge here, too, as it would continue the journey towards greater professionalism and consistent standards in our industry. The topic of digital disruption often comes up in conversations with our clients, but I suspect most of us have not given much thought to its potential impact on the coaching industry. Professor David Clutterbuck shared some of the examples of digital innovation that could become disruptors over time, including where virtual worlds are being used in therapeutic environments, such as to help teenagers externalise issues they are facing. The technology is interesting, but at this stage, I’d say that if anything it is a potential support to coaching, rather than a challenge to it. Innovation tends to impact the most mechanistic aspects of an industry first, so the first areas where we can expect digital disruption to emerge will most likely be in areas such as basic skills coaching. I believe it will be a very long time before we see machines replacing humans in performance and developmental coaching (though I acknowledge I could be wrong on this point!). As virtual coaching via Skype and Zoom increases, we may see a concomitant growth in labour and exchange rate arbitrage, whereby highly trained and experienced coaches in lower cost locations provide virtual services to coachees in high cost locations. If I were a coach based in New York or London, this would be something to think about over the medium term. The falling value of the Australian dollar has actually opened up an opportunity for Australian based coaches seeking to export their skills, both in person and virtually. Doctor Bryan Dik shared a fascinating perspective on how finding one’s purpose can allow better matching between individuals, careers and specific organisations. If you have a client or family member pondering career choices, you should consider pointing them toward’s Bryan’s website, www.jobzology.com, which has a set of tools to allow people to better understand their own drivers and then match these to specific roles based on the US job categorisation database. I ‘test drove’ this with someone really close to me after the conference, and it crystallised some of the personality characteristics of that person in a way I hadn’t seen before. Very, very useful. It would be worth considering for coachees looking to transition out of the workforce as well, in order to help them identify ways to find meaning and purpose as they transition away from full-time work. Judith Glaser, the first keynote speaker, shared presemted and then delivered a powerful workshop around the latest developments in neuroscience as applied to coaching. I had the pleasure of catching up with Judith and her husband for dinner in Sydney after the conference, and she is clearly a master of both the science and art of coaching. Her work on Conversational Intelligence, and the three levels of conversation, is a powerful lens through which to consider and then improve the quality of our conversations in every aspect of our lives. The conference was filled with energy and dynamic conversation. It was pleasing to see just how far the Australian and New Zealand coaching profession has come, and what a vibrant and capable coaching community we have. Our industry has a long way to go on the journey towards becoming a profession, but clearly we have made significant progress over the past several years.